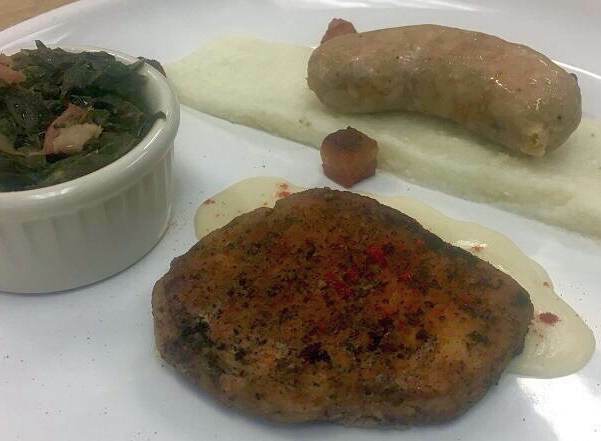 Home » Featured » Stories From the Lab: Fine-dining Cuisine…on a $20 Budget? 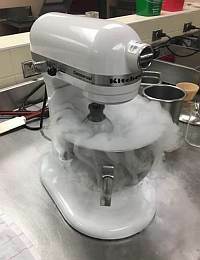 Hello, and welcome to another edition of my culinary science blog! Last week, we discussed “Fun with Yogurt”. 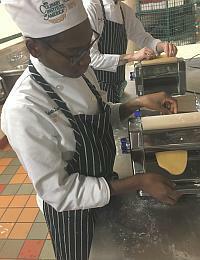 [This time around, my classmates and I were tasked to create a fine-dining meal using techniques and applications that we have learned in class thus far. 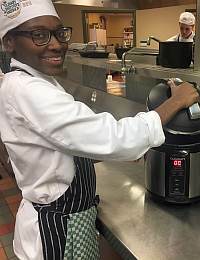 I am super-excited to share and showcase some of my classmates and their beautiful culinary skills. 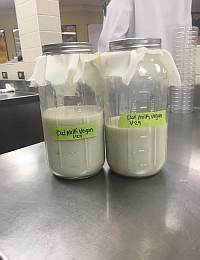 This project was called our “Multi Protein” lab—each of my classmates and I got to choose any animal protein to cook, and we had to utilize multiple components and parts from that animal. There was a catch, however—we each had to stay within a $20 budget to make three plated portions. We had to cost the price of the meats, vegetables, fruits, and dry ingredients based on the inventory price list from the CIA’s main storeroom, meat room, and fish room. These storerooms are the college’s centers for ordering and processing food products, which are then dispersed to the kitchens and restaurants around the school. Laurie grinded and made her own hot Italian sausage that she paired with braised pork belly. 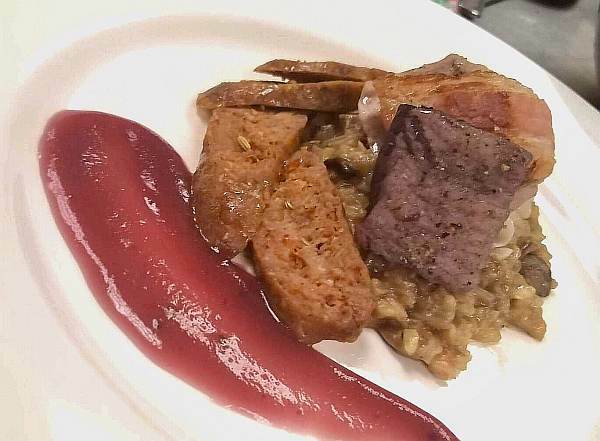 She then finished off the dish with a sous vide mushroom risotto, a fennel balsamic salad, and blackberry red wine fluid gel. 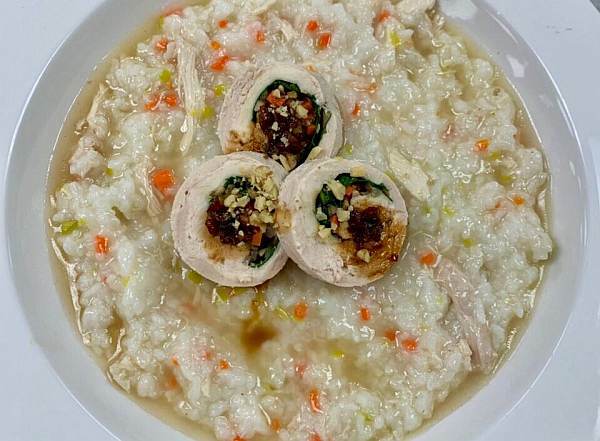 Eun showcased Korean flavors by creating a chicken roulade dish inspired by traditional Korean chicken congee. Eun stuffed the chicken and sous vided it for about 2½ hours at 60 degrees C. The final dish included rice and carrots in a chicken broth. 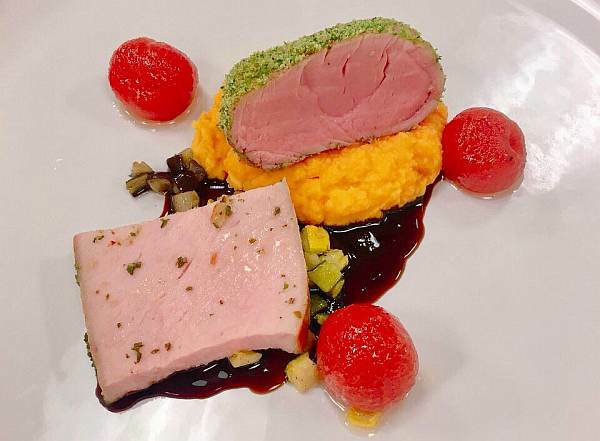 So Yeon created sous vide pork tenderloin that she put under smashed sweet potatoes. She then paired the pork with candied cherry tomatoes and a balsamic glaze. 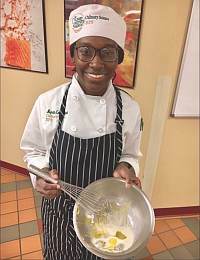 Paige created a blackened pork chop paired with collard greens that she cooked with smoked ham hocks, onions, and green bell peppers in the pressure cooker. She also made butter grits that she prepared via sous vide and fried pork belly. She finished off the dish with a pork chaurice and caramelized onion cream sauce. For my dish, I wanted to use a technique that I’ve never done before. The protein I chose was chicken, so I decided to make sous vide airline chicken breasts and a sous vide chicken leg roulade that I deboned and stuffed with shredded mozzarella, spinach, and mushrooms. 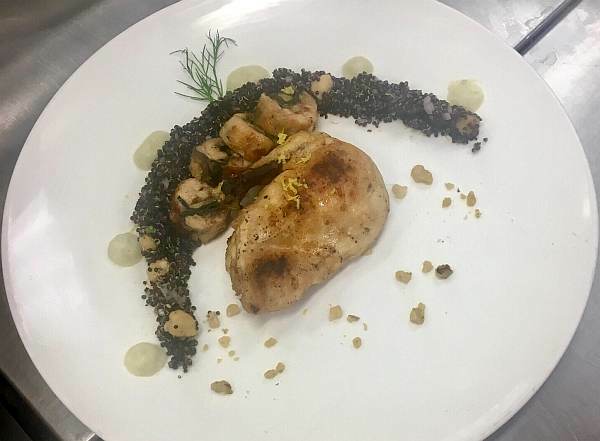 I paired the stuffed chicken with a black quinoa and chickpea mint blend that I prepared via a pressure cooker. I absolutely adore all varieties of quinoa. It became one of my favorite foods to eat and cook ever since one of my favorite chefs at the CIA, Chef LiPuma, used it in one of his recipes at American Bounty. 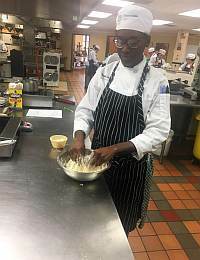 While in his class, I had worked the garde manger station, also known as the cold prep station, where I was in charge of preparing the quinoa every day. Cooking quinoa in the pressure cooker is my newest beloved culinary secret. It’s super-fast and cooks in one minute on high pressure, compared to the 20 minutes it takes on the stovetop. (Although I guess it’s not really a secret anymore since I’m sharing it here!) I finished off the dish with a fennel cream puree and roasted walnuts and lemon zest as a garnish. This lab allowed our creativity to go wild! One of my classmates was inspired by modern Californian cuisine and even created his own cucumber gelling spheres that he made with agar. 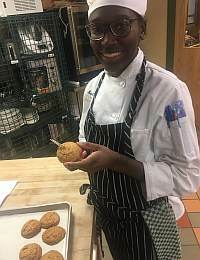 Another classmate showcased edible wildflowers, while still another made an avocado sauce. 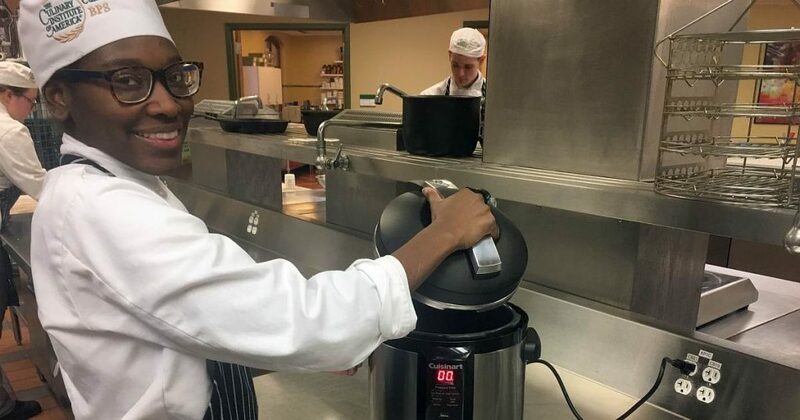 All of the items being prepared were made with equipment that promotes precision temperature cooking. 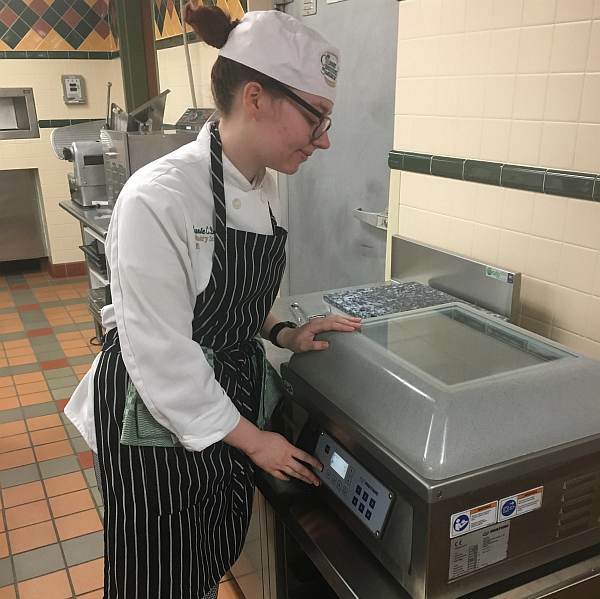 This equipment included sous vide machines, dehydrators, pressure cookers, CVAPS, and Rational ovens. 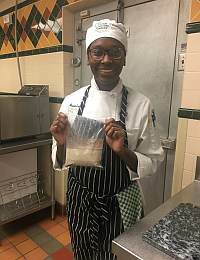 The assignment showed us that high-quality meals can be made with a budget of $20 or less. Our professor, Chef Lui, gave high marks for our whole class and praised our hard work and efforts.